Looking for a Public Insurance Claim Adjuster in Port Saint Lucie, FL? Contact the PSL professionals at Accredited Public Adjusters, LLC. Claimants go through hard time when processing insurance claims. This therefore requires that they seek the services of Public Adjusters to represent them. Public Adjusters are professionals who are specialized in advocating insurance claims of policyholders. We are going to provide you with vital information about Port St Lucie Public Adjusters so that you can employ their services when you are in need. First and foremost, Port St Lucie FL Public Adjusters will appraise the damage on your behalf. This involves assessing the value of the property or asset that was damaged. They then evaluate the loss to find out exactly what should be paid for adequate settlement.This helps to make sure that as a policyholder, you are covered according to your property value. Port St Lucie FL Public Adjusters also read the policy of insurance to the insurance company. This is done to ensure that the policyholders they are representing are covered as per the provisions of the policy. It acts as a binding agreement which must be adhered to. These unequaled Public Adjusters have exceptional negotiation skills which enable them to effectively argue your claim with the insurance company so that you are sufficiently covered. This is what makes them stand out from other public adjusters. They are the best fit for you if you are looking for excellent service. 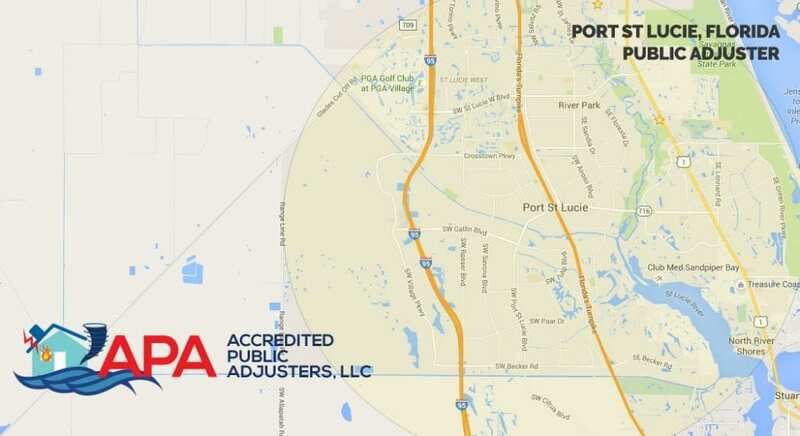 To add on, Port St Lucie FL Public Adjusters offer their outstanding services at an affordable price. They don’t charge high price. This enables you to have your insurance claims processed at a low cost. You definitely want to hire them. Into the bargain, these Public Adjusters are accredited. They are officially recognized and authorized to provide their services to policyholders. They meet all the essential requirements for public adjusters. So when you hire them, know that you are dealing with the right people. In conclusion, never stress yourself to appraise and negotiate insurance claim on your own. Port St Lucie FL Public Adjusters will do it for you in the best and most effective way. GUARANTEED.